When choosing bathroom flooring you must make sure that the flooring material you are picking is water resistant and durable. When shopping for flooring materials for your bathroom you will come across a wide variety of tiles, specially designed hardwood flooring and several other fascinating options. Your duty would be picking a material that suits your bathrooms decor perfectly. If you want to use flooring materials that will match all kinds of bathroom design and decor, you must choose bathroom floor tiles of neutral colors. The neutral shade that will work best for this purpose is white. White flooring will not only match the decor of your bathroom, but will also make it look much bigger than it actually is. So, if you have a bathroom with petite floor space, you should not look beyond white flooring. 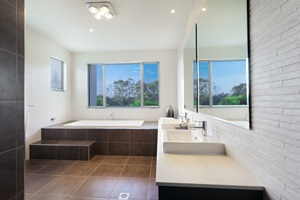 If you have a big bathroom and you want to give it a perfect luxurious look, you should opt for dark bathroom flooring. Some common shades you will get to choose from when shopping for dark bathroom flooring include: black, brown, gray, slate and dark green. You should pick a color that complements your bathrooms walls, fixtures and cabinetry aptly. 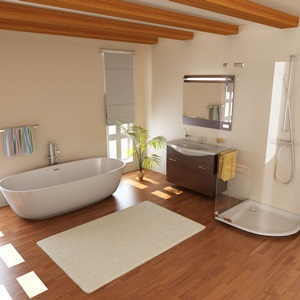 Earlier hardwood flooring was not considered a good flooring option for bathrooms. However, things have changed now; availability of presealed modern hardwood flooring has allowed many homeowners to install hardwood floor in their bathrooms. The modern day well-sealed wooden floors possess the ability of standing up to excessive moisture and thus are perfect flooring options even for bathrooms. 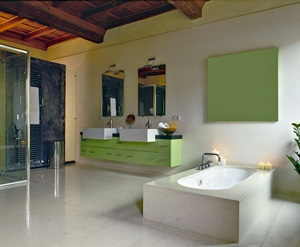 We can provide you with bathroom tiles of all possible kinds. You may be looking for soft tiling or hard tiling, or may be in search of flooring materials of a specific color we will surely be able to offer you exactly what you are hunting for. Just contact us and inform us about your needs and preferences, we will give you different bathroom flooring ideas matching your requirements and liking perfectly. Yes whatever may be your need as far as bathroom flooring is concerned we will be able to give you the opportunity of choosing between multiple amazing options. We offer flooring made from granite, mica, quartz, rubber, hardwood and a range of other scratch resistant durable materials. Among all Pittsburgh flooring companies we are the most professionals in this kind of flooring installation!